Career : 1978 - 1982. Guernsey No. 48 (1978 - 1982). A hefty 193 cm ruckman-defender from Mooroolbark, big Geoff Hocking spent five seasons at Princes Park, working his way up through the Under 19 and Reserves teams to finally make his senior debut in 1981. When he did, he earned himself a niche in Carlton Football Club history as the first Blue to wear guernsey number 48 in a game for Premiership points. Geoff arrived at Carlton in 1977. He embraced the team ethos, and by 1981 had twice been voted the Reserves Best Clubman – but Carlton’s player list was as strong then as any time in our history, so competition for senior places was intense. Eventually however, an injury to champion full-back Geoff Southby gave Carlton’s match committee the opportunity to blood someone new, and Hocking was called into the team to play Melbourne at the MCG in round 7, 1981. The Blues thumped the struggling Demons by 40 points that afternoon, while Hocking was given a baptism of fire by Melbourne’s unpredictable full-forward Mark Jackson, who worked him over both physically and verbally. After that somewhat traumatic experience, Hocking went back to the Reserves until round 14, when he was recalled to the interchange bench for the game against Footscray. Another four senior matches followed prior to round 19, when the Blues defeated South Melbourne by 23 points at the MCG on a Sunday afternoon. That was a notable occasion, because it was the last game of VFL football played between these two foundation clubs. In 1982, South Melbourne would become the Sydney Swans, and the VFL would evolve into the AFL. Round 19 was also the last match of Hocking’s career, because he played out the last few rounds of the season in the lower grade while Carlton's senior team swept to that year's Premiership. 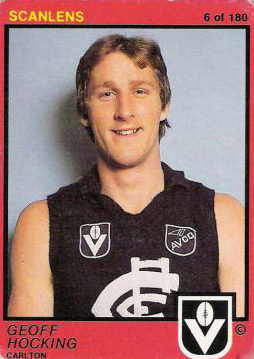 In 1982, Hocking was cleared to Claremont in WA to complete the deal for defender Ken Hunter, who had transferred to Carlton the previous year. A computer programmer by profession, Geoff later played footy in the ACT. In 1988, he returned to Victoria, and lined up for VFA club Box Hill. Geoff's older brother Russell Hocking played U/19's and reserve grade football for the Blues. Contributors to this page: Jarusa , Bombasheldon , pblue , PatsFitztrick , tmd1 , molsey , WillowBlue and admin . Page last modified on Thursday 18 of May, 2017 10:14:21 AEST by Jarusa. 2001 - Ian Collins Interview (pg 2 of 2) 30/05/01.